Be especially alert in early morning and late evening Dawn and dusk are the times you are most likely to encounter deer along the road. Always utilize your peripheral vision when driving and look as far ahead as possible so that you can anticipate any potential encounters with moving deer. Know when to use your high beams. High beams can help you spot the reflective eyes of an animal and see better on dark roads, but they can also hypnotize deer. If you see a deer frozen in the road, slow down as much as possible and flash your lights to snap its trance. Never swerve. Unless you're about to hit a moose (which can crush a car), you should never swerve to avoid hitting a deer. Swerving could make you lose control of your car, send you into oncoming traffic, and confuse the deer on which way to run. Don't speed up. You may have had someone tell you that you're actually supposed to speed up when you see a deer. This is mostly untrue. 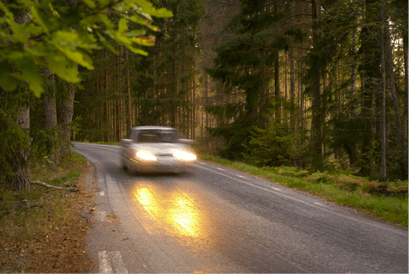 Slowing down as much as possible greatly reduces the likelihood of damage and injury, so you should always brake as soon as you see the deer. However, you can take your foot off the brake on impact to reduce the likelihood of the deer coming through your windshield. Watch for signs. Always pay attention to road signs indicating deer or other large animals. 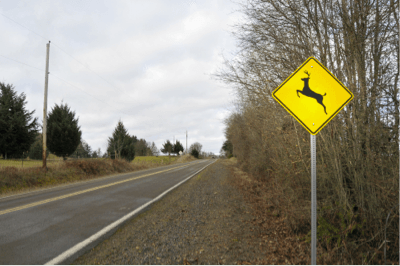 These signs are placed in areas of larger deer populations or known migration paths where road crossings are frequent. 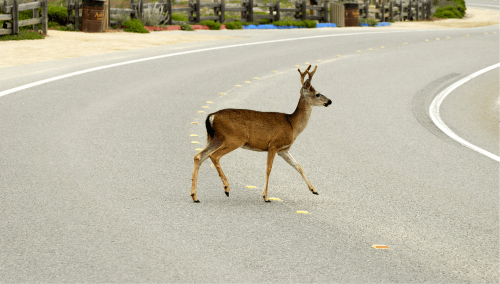 Move into the center lane if you are traveling on a multilane highway, to give yourself more time to spot and react to a deer in the road. Make sure your headlights, brakes, and power steering are all up to date on maintenance and in good working order. Not sure if you're due for a service? Give us a call.